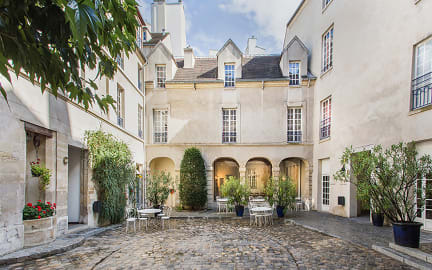 Over the last 50 years, MIJE association has renovated three 17th century buildings to create a trio of exceptional youth hostels : MIJE Fourcy, Fauconnier, Maubuisson, located in Paris' historic Marais district. Perfect location to discover the richness of the city. A continental breakfast is included in all price schemes and is served in the dining room of our three hostels. There's a restaurant where guests can have lunch/dinner. Free WIFI access on the ground floor is provided. There are also city maps and information about Paris. In our common rooms you will find books. A free luggage storage is available in all the hostels. The premises are secured and a receptionist is on site 24/7. The 3 buildings are located in the same area. After your booking, you will receive an email with special check-in instructions. For more details, please contact the office using the information on the reservation confirmation received after booking. All together the hostels count more than 400 beds in private or shared rooms (from 1 to 10 people).The bedrooms are private or shared, with washbasin and shower. Beds are made on arrival and rooms are cleaned daily. Towels are not provided. Compulsory Membership card: 3.00 euros per person. Membership is valid for 1 year valid during the current calendar year. You can avail of many advantages in the Marais area with your membership card, Please ask at the reception, we’ll gladly give you more information on arrival. Payment types accepted at this property: cash (only euro), credit card. American Express are not accepted. Failure to cancel within this time will result in a cancellation charge equal to the first night of your stay. Other nights will automatically cancelled. Taxes not included - In addition anyone over the age of 18 staying at MIJE will be charged a City Tax up to a maximum of €2.88 per person per night. This will be payable at check –in. Breakfast is served from 7.00 am to 10 am. For individual: Minimum check-in age is 18. Absolutely amazing! I will be coming back. The location was perfect, always felt safe walking around. Absolutely loved it here!! Location was ideal for a quick visit to to Paris, staff was kind, welcoming, and helpful, and the buildings themselves were beautiful and clean. Great place for it's price with nice addition to keep your baggage after check out if you want to go to city before you leave. Hostel was perfect for solo traveler. Great staff, great location and room was just enough for what I needed. Pros: Location is so perfect. Very beautiful building and room was very clean. Each bed has a light and usb charger. (1 power sockets in the room and the other one in a toilet). Nice common room with bookshelf, vending machine, charging by usb or power socket there too. A common toilet next to common room. Cons: No elevator, No kitchen to use, No locker in the room. Overall, it was so nice to stay in MIJE for me. Breakfast was fare enough to that price. I will stay again definitely! Sometimes a little nosy with all the students but other than that, beds are comfortable and it’s an amazing location. I have stayed at MIJE fourcy 3 times. This hostel could be fantastic, as the location is absolutely perfect & the buildings are beautiful. However the lack of powerpoints in the rooms (maybe 1 in a dorm + 1 in the bathroom) is a real let down, & also some of the rooms have a sink/ shower in a kind of alcove in the room with only a shower curtain as a separation, so when someone showers steam comes into the room & its super noisy. It is a shame because it could be so fantastic with a few changes! Good location, stayed in the 10 person female dorm but it was broken up into a 3 person room and a 7 person room, and we had our own bathroom/showers which was nice. However, there was only 1 outlet for our room and there was no soap to wash our hands with. Would be nice if they put in an extension cord or something.